I love when people create cool mash-ups featuring various franchises beloved by geeks. I have a ton of t-shirts that combine things like Star Wars and Donkey Kong and Doctor Who and Super Mario Bros among many others but I can always use more! The only Star Wars and Doctor Who mash-up shirt I currently have is one where R2-D2 and C-3PO are combined with a Dalek and Cyberman and while I love that shirt, I think I like this one a little bit more! 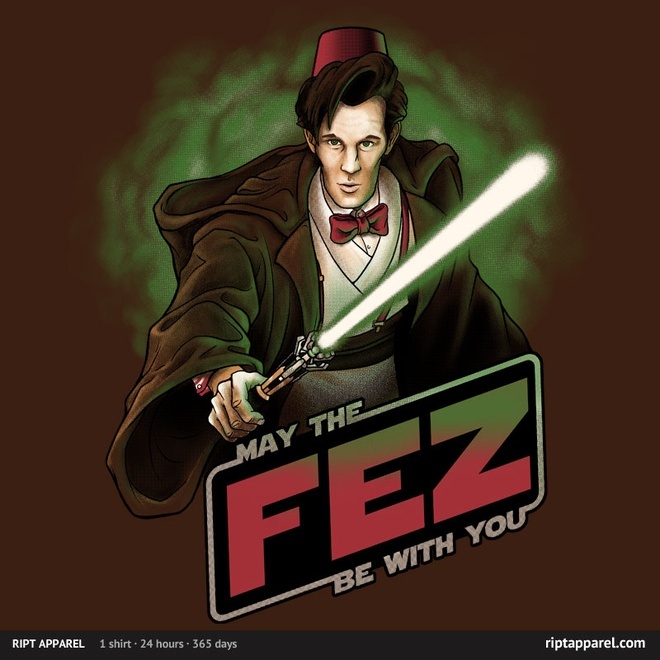 For today only, the awesome folks at Ript Apparel are selling this super geeky May the Fez Be With You shirt for just $10! The design which was created by ianleino is not just available as a t-shirt, but you can get it in many other forms too ranging from iPhone cases to coasters (the prices varies depending on what you want of course). For those that love Doctor Who and Star Wars, they are going to love this design that combines the 11th Doctor in his fez with the popular line from Star Wars and a lightsaber version of a sonic screwdriver. Being a fan of both franchises, I am definitely ordering one of these shirts! You can’t beat that price! Share this with any Doctor Who fans and Star Wars lovers you know! Like Fanboy Fashion on Facebook too!